Can you believe that Easter is only a few short weeks away? Where did that time go? Anyone else feel like they only just got over Christmas?! But over the past couple of weeks, there has been the tiniest sniff of spring in the air, which is enough to give our spirits a much-needed lift. And if you’ve not done so already, starting to get ready for Easter is a great way to start looking forward to Spring. Easter celebrations don’t have to be expensive, and the fun isn’t all reserved for the kids! I’ve come up with a fantastic (and extensive!) 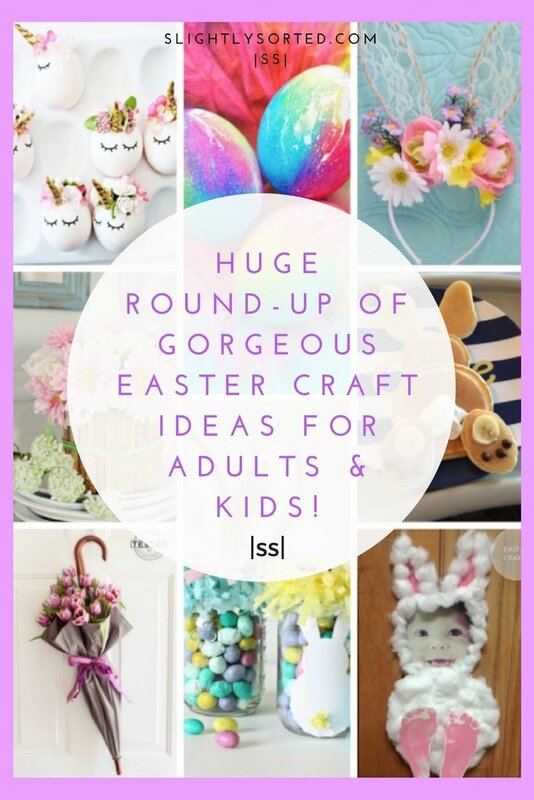 round-up of some gorgeous DIY Easter craft ideas and DIY Easter decorations. I’ve really scoured the internet for the prettiest and most fun ideas, so you don’t have to! So what are you waiting for? 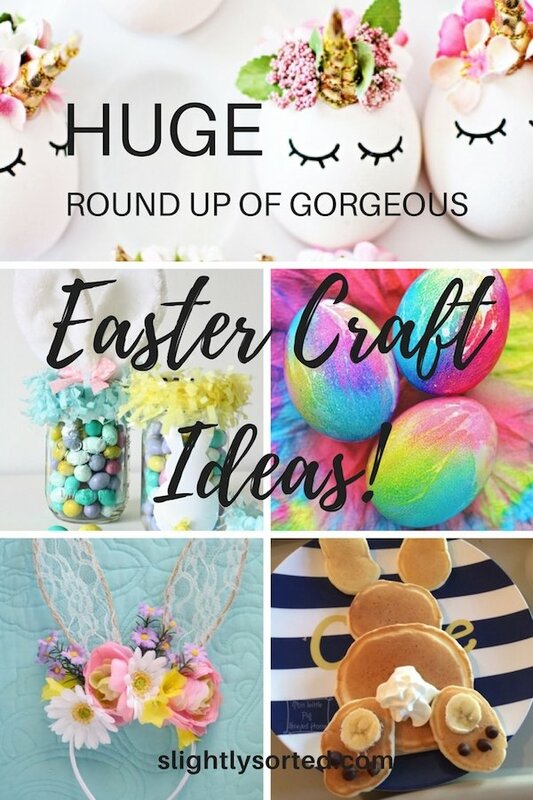 Without further a do, let’s dive into some amazing DIY Easter craft ideas and decorations… enjoy! 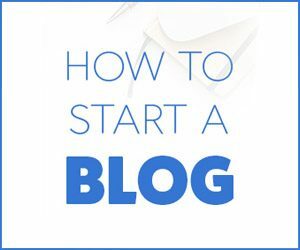 Some links onÂ slightlysorted.comÂ are affiliate links. Please see the disclosure tab on the main menu, side bar or footer for full details, thank you! Nothing is more synonymous with Easter celebrations than eggs! 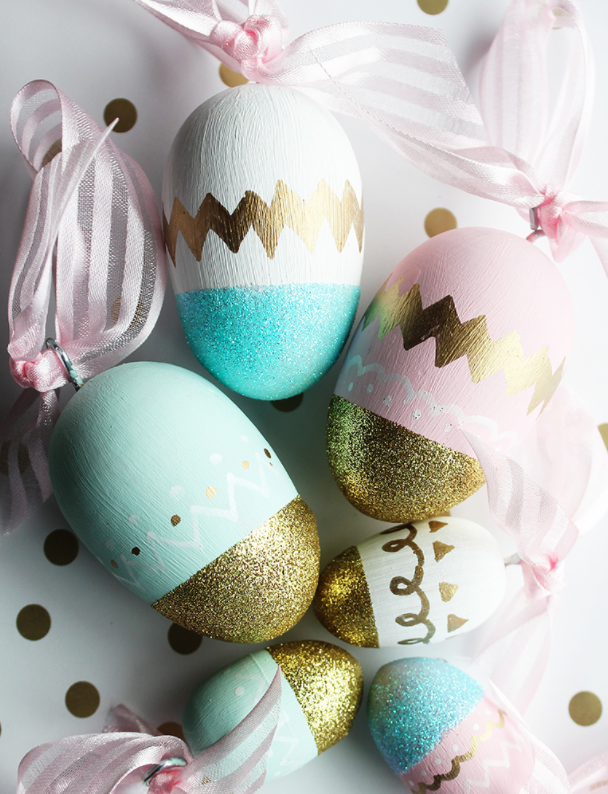 So let’s start there, with these amazing ways to decorate eggs to turn them into designer Easter decorations! 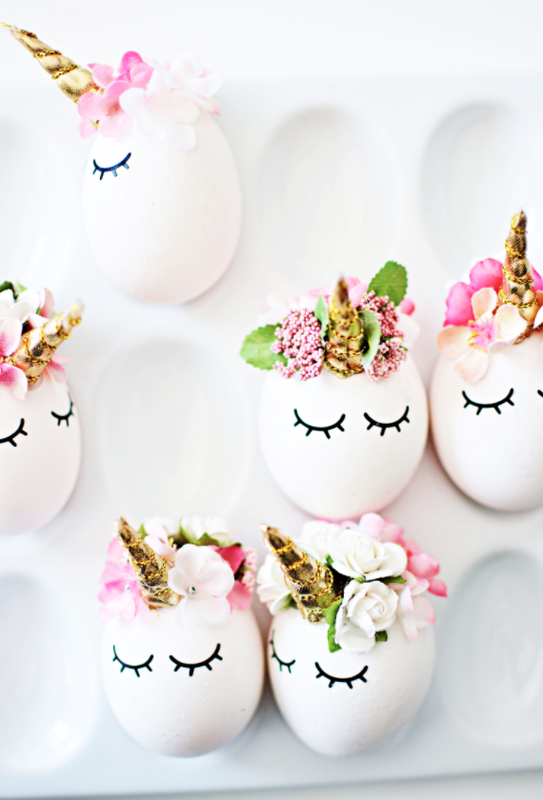 These unicorn eggs are amazing!! 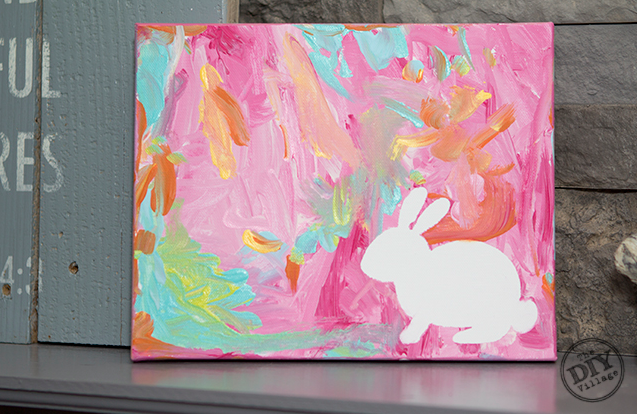 Definitely one of my favorite DIY Easter craft ideas of all time. 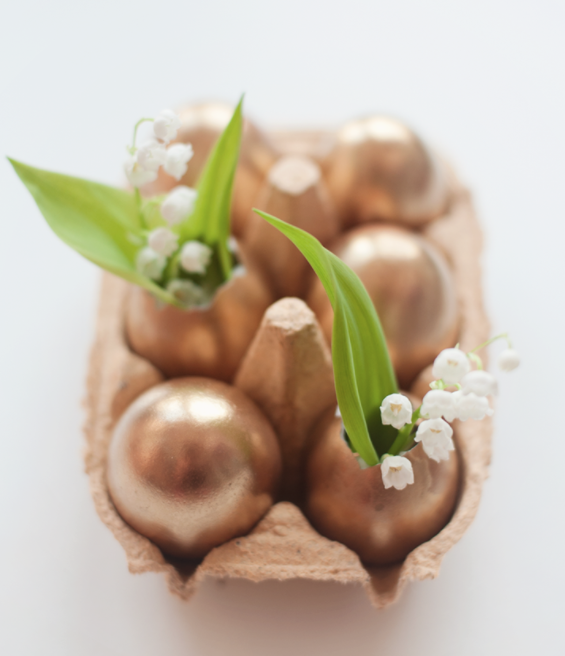 All you need to recreate these is some tiny flowers like these, gold fabric, gold twine,Â hot glue and some felt (plus the eggs!). Find all the instructions on littleinspiration.com. Look at these gorgeous copper-gold eggs! Making them couldn’t be simpler, you just need some gold spray paint. This idea is from 79ideas.org, I love it! By the way, make sure no little ones try to eat your fancy decoration eggs, all this paint and glue really isn’t fit for human consumption, even if it does stay on the outside!! Tie Dye Easter eggs, who’d have thunk it! A big bowl of these would make a great dinner table centre-piece. All you need to make them is some food coloring, kitchen towels, and rubber gloves if you don’t want tie dye hands too. Find the tutorial over at onelittleproject.com. 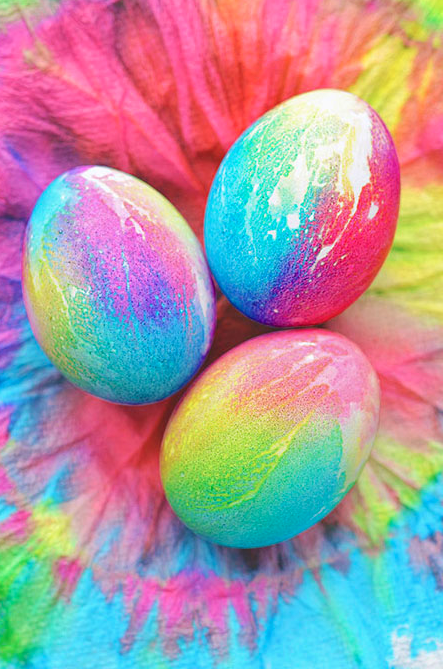 These decorated eggs are so pretty! 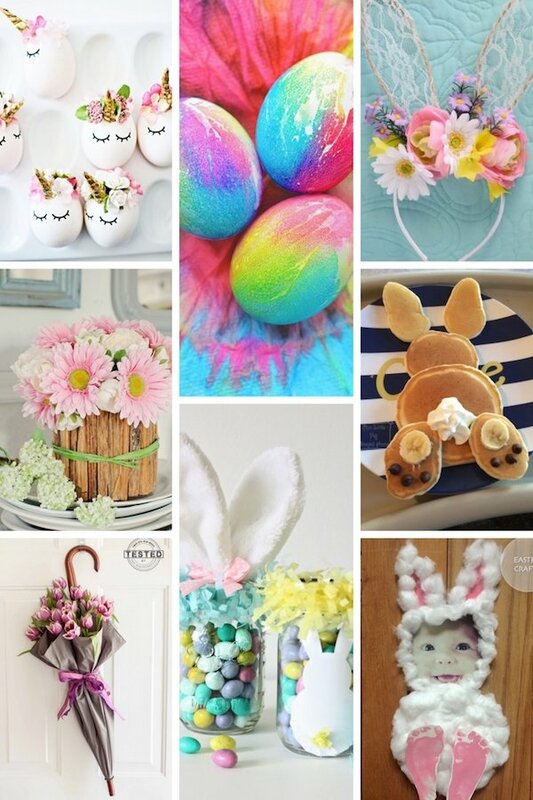 Although you could decorate real eggs in a similar way, if you want to hang these up like the ones in the picture, you’ll need to get yourself some wooden eggsÂ and eye pins to work with. Find the whole tutorial over onÂ positivelysplendid.com. And when you’ve finished, how about hanging your gorgeous glitter eggs on a simple white tree like the one below, for a stunning indoor Easter display. You can get a similarÂ white tree with LED lights on Amazon. For more tree decorating ideas, head over to blog.hobbycraft.co.uk. 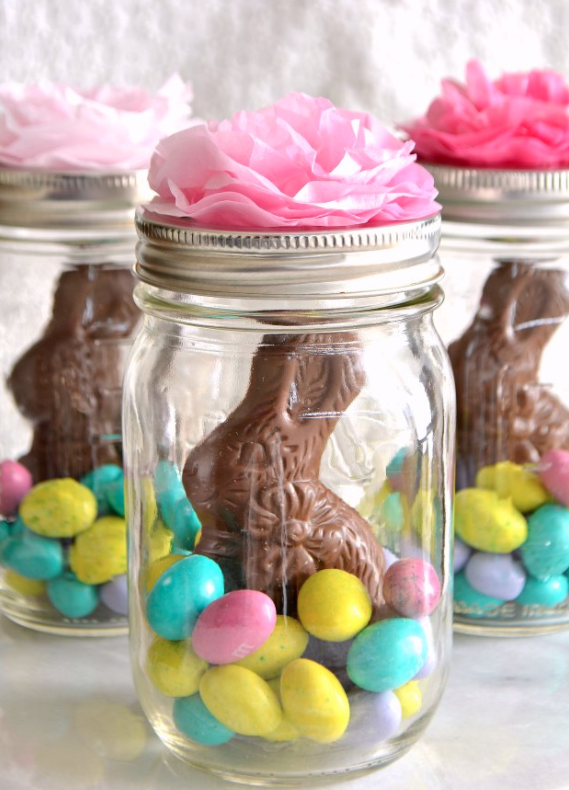 Good old mason jars can be used in a multitude of ways to make gorgeous decorations, and lovely pots for Easter gifts. You can pick up great deals on mason jars on Amazon. 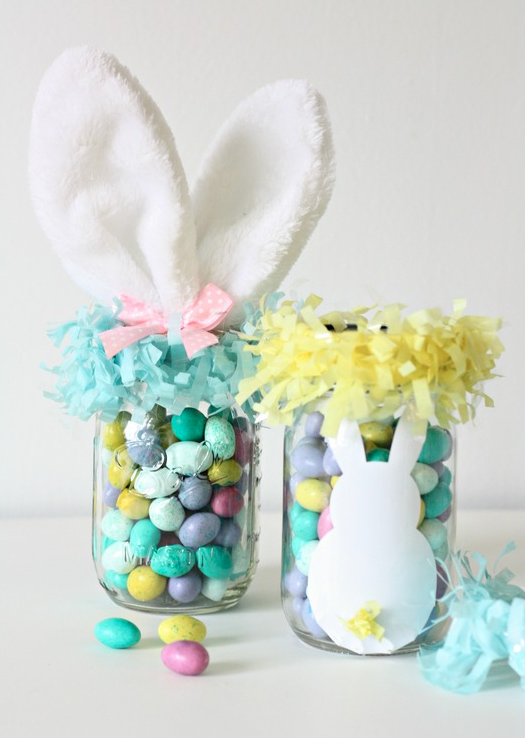 Ahh, how cute are these Easter Bunny mason jars! They’re so gorgeous, yet so easy to make. You’ll need some hot glue again, and don’t forget your bunny ears! This lovely idea is from nestofposies-blog.com. How about these sweet tissue-paper flower mason jar gifts? So simple, yet so lovely! You’ll find them at hellolittlehome.com. 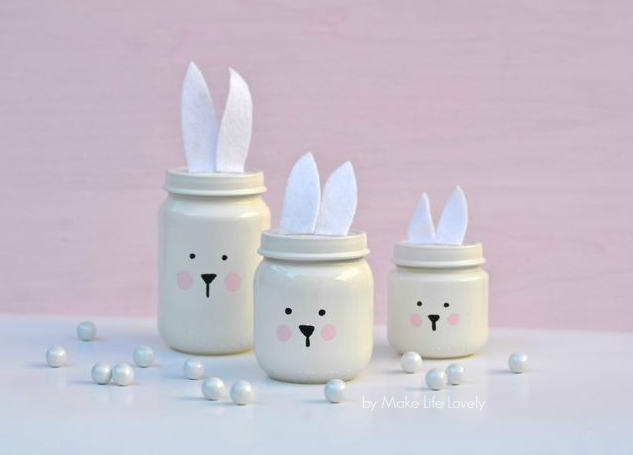 You could also try painting your mason jars, or use baby food jars too like these cute white bunnies! Just grab yourself some white spray paint and pink/black acrylic paint, and get busy! Find these over on makelifelovely.com. 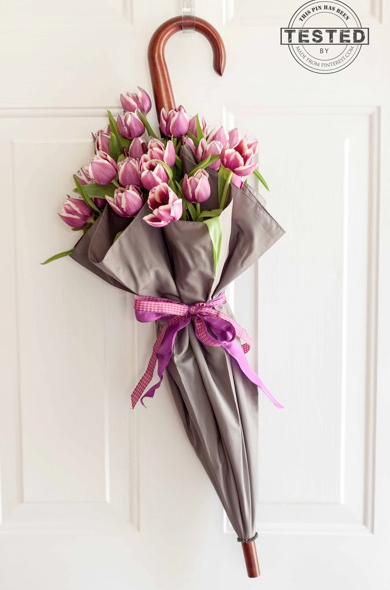 Nothing says Spring like some beautiful blooms! Celebrate Easter, and the arrival of Spring, with one of these gorgeous DIY floral Easter decoration ideas. This umbrella wreath from thisgrandmaisfun.com is amazing (and what a cool name for their website too!). This arrangement is super simple to make, and you can use artificial or real flowers. If you’re going for fresh flowers, you can use some floral water tubes to keep them fresh for longer. 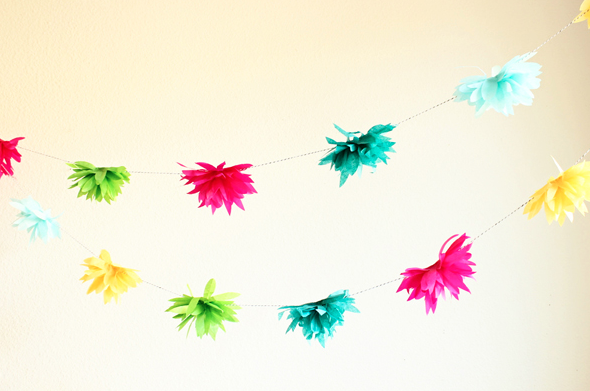 If you’re after some bright and bold Easter decor, try out this simple tissue flower garland from youaremyfave.com – although you could of course make it with pretty pastel colors if you prefer! 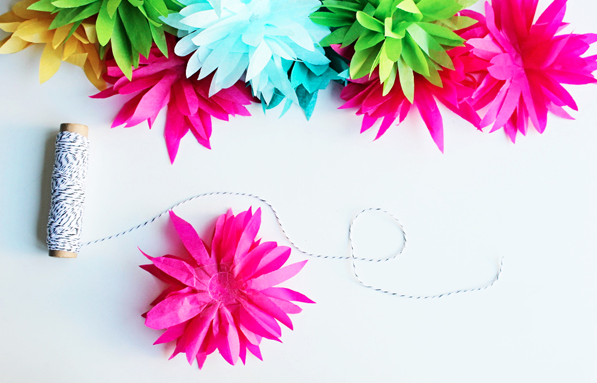 It’s simple to make, just grab some pretty tissue paper and some glue dots, and get to it. 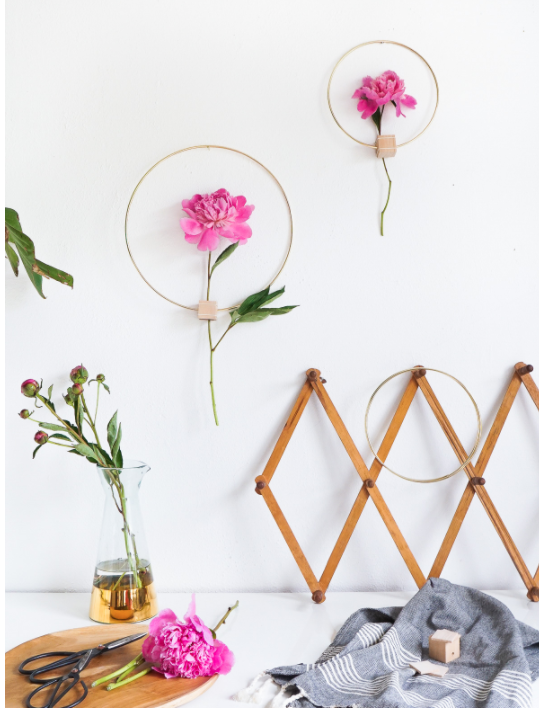 If you’re ready to take on a little DIY project, these minimalist fresh-flower wall hangings may be just what you’re after. Perfect for Easter’s spring blooms, they’ll take a little bit of effort to create, but really are well worth it. The tutorial is over at sugarandcloth.com. 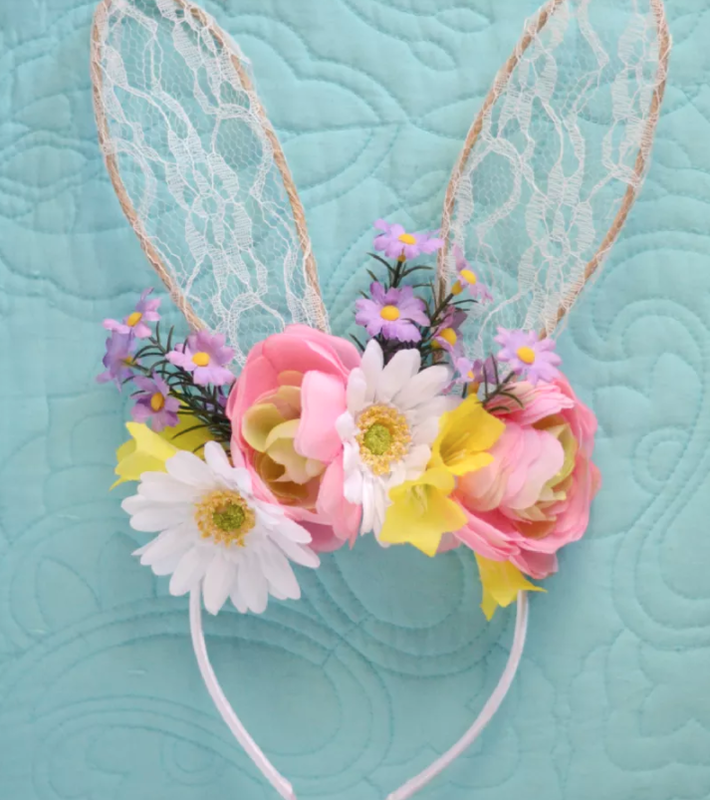 I couldn’t resist including this floral bunny-ears headband! What a fun idea, and a great alternative to a traditional Easter bonnet. You can create something very similar using ready-made bunny ears, or make your own lace ears like the picture, using some wire, lace and a headband. You’ll also need your good old hot glue again, and of course some pretty artificial flowers. The tutorial is onÂ kidandkinblog.com. 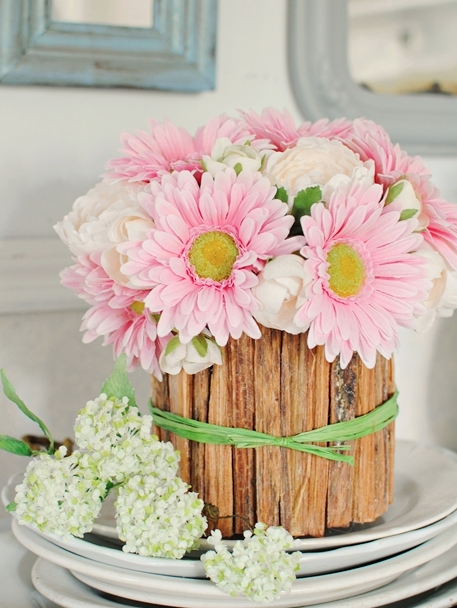 This gorgeous DIY rustic vase will make a beautiful centrepiece for your Easter dining table. It’s made by using hot glue to attach kindling wood to a cylindrical vase, and is actually deceptively simple to create. Go on over to the tutorial at town-n-country-living.com. 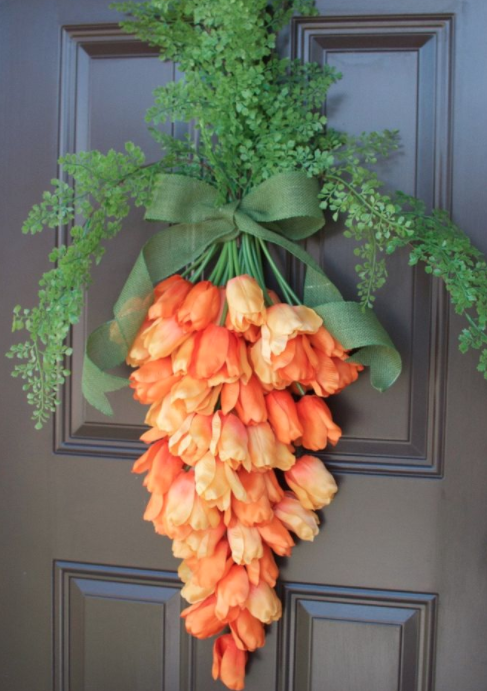 Here’s an unmistakably Easter-y DIY door decoration idea! What a great concept, and again it’s actually pretty simple to make – head over to hometalk.com to get all the instructions. 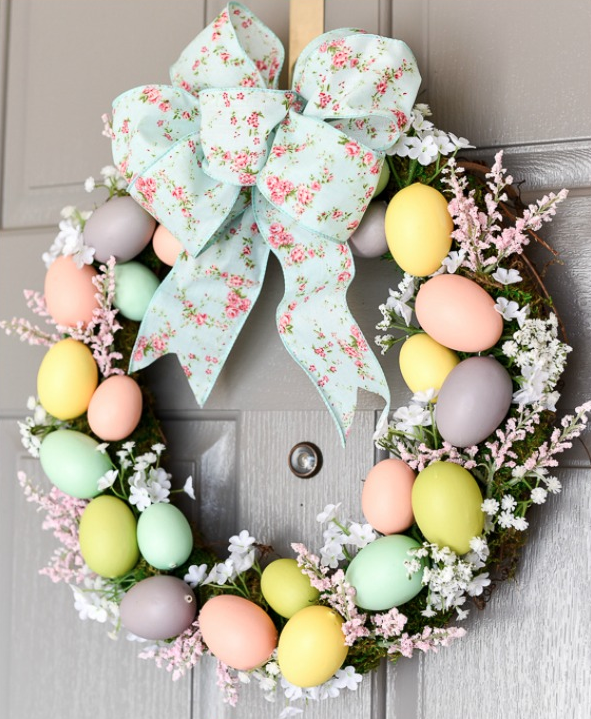 Or you could go for something a little more traditional, with this beautiful Easter egg floral wreath! This will take you longer to create, but so long as you use wooden eggs and artificial foliage, you’ll be able to enjoy it for years to come. You’ll find the details onÂ apumpkinandaprincess.com. 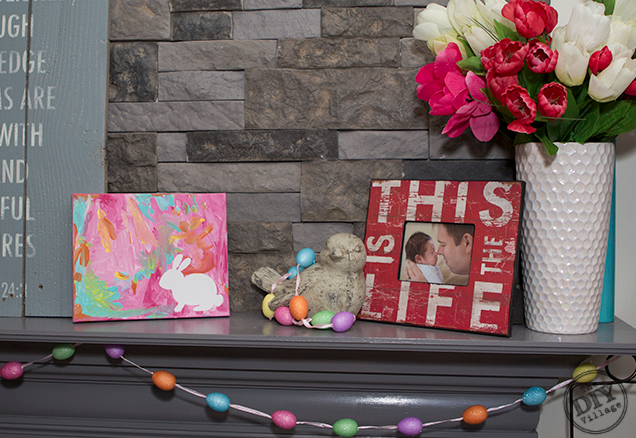 There are some beautiful DIY Easter craft ideas around when it comes to wall art. The beauty of these ideas is that your creations won’t really age, so if you store them away carefully, they’ll bring a smile to your face year after year! This bright artwork is supposed to be for toddlers to make, but is it just me that’d be delighted to make this myself?! It’s bright, completely customisable, and perfect for Easter. You’ll need an 8×10 canvas (or whatever size you prefer) and some decent craft paints. Find the full tutorial at thediyvillage.com. This may not be for you if you’re looking for something stylish and sophisticated, but if you’re after fun and CUTE with a capital C, then you’ll love it! 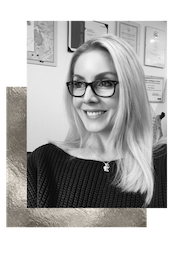 I’m definitely going to be trying it out – details at lifeunexpected.co.uk. 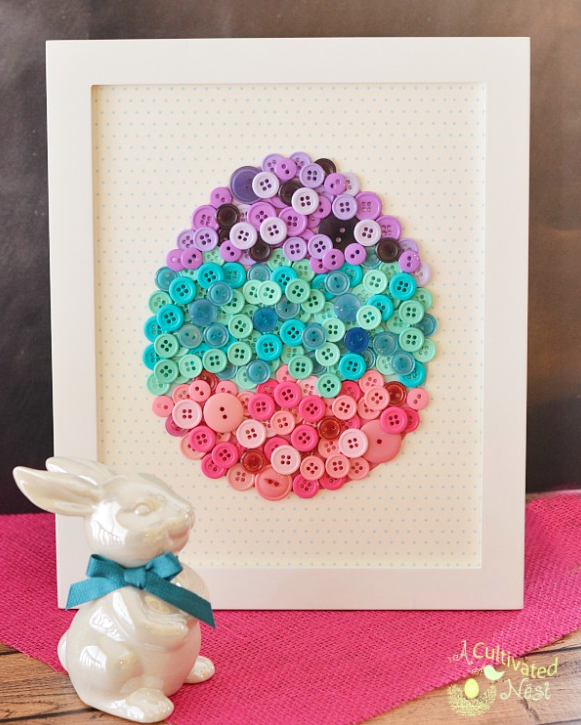 How about trying out some pretty button art? This simple egg is perfect for Easter, but you could adapt it to do a heart or simple flower… or whatever you want basically! You will, of course, be needing some buttons for this one. The tutorial is over at acultivatednest.com. 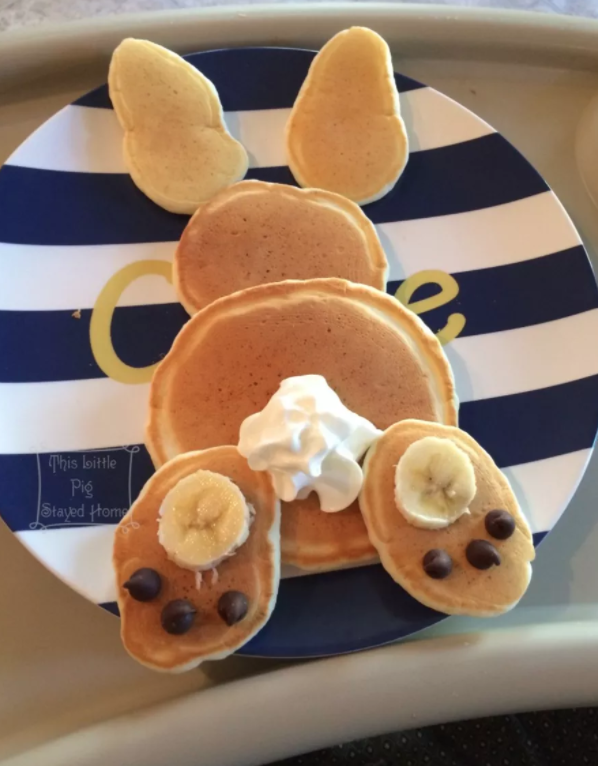 While this one may not technically fall into the category of DIY Easter craft ideas, I just couldn’t resist slipping it in at the end… because just how amazing is this Easter bunny pancake arrangement?! A practically perfect Easter treat if ever I saw one! The details are onÂ thislittlepigstayedhome.com. 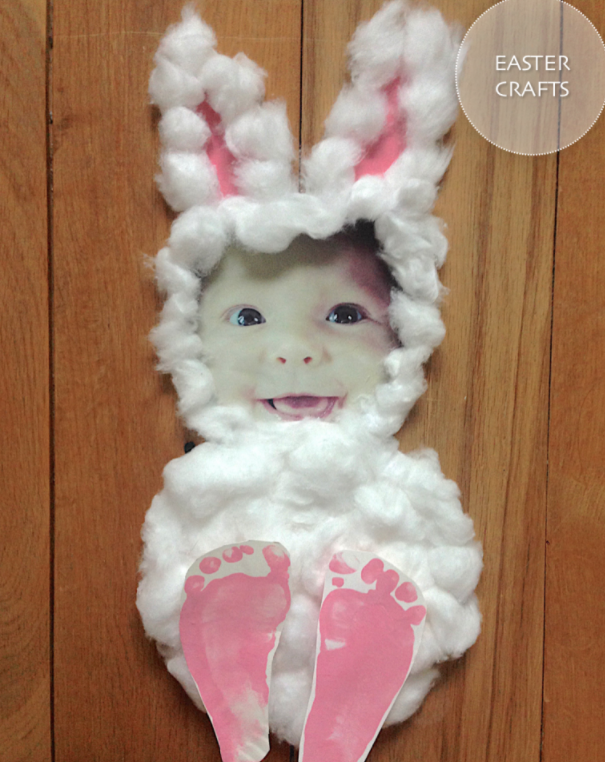 Enjoyed this post DIY Easter craft ideas? Why not save it for later on Pinterest! Next Post What Is A Gong Bath?